According to trade theories, the average quantity of exported goods is not the only parameter of export performance – the variety and quality of exports also play an important role. 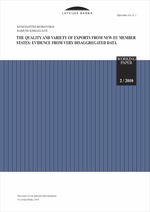 The goal of this paper is to evaluate the variety and quality of exports from the new EU member states in 1999-2009. Beside unit values, which play an important role in defining export quality, our calculations also take into account market shares and the level of monopoly power of firms in a particular market. We found that all NMS significantly increased their average number of brands exported to the EU market; moreover, all NMS were able to increase the average quality of their exports during the 10-year period.